#HRWins praises LifeWorks for leading the way in bringing employee assistance programmes into the 21st century. 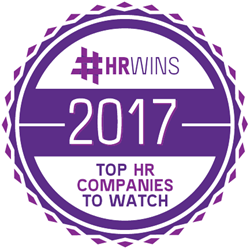 Employee well-being provider LifeWorks (https://www.lifeworks.com/uk/) was named one of 2017’s Top HR Companies to Watch by #HRWins. Based on ongoing research and technology briefings, #HRWins found that LifeWorks is an industry leader in several aspects of the employee experience. This recognition focuses on how the LifeWorks solution contributes to the talent management, payroll and benefits, and total well-being phases of the employee experience lifecycle. It also revealed that LifeWorks is most impactful for medium-sized companies (301 to 5,000 employees) and enterprise-level businesses (over 5,000 employees). An easy-to-use mobile experience, putting employee assistance directly in everyone’s hands. A total well-being strategy that targets physical, emotional, personal, professional, and financial wellness. A single application that provides all employee assistance and wellness programme elements, making it convenient and accessible. The advanced EAP Dashboard, delivering in-depth analytics and insights to help employers track behaviour, utilisation, and popular wellness trends. To find out what other companies made the list, visit http://larocqueinc.com/hrwins-companies-to-watch-employee-experience-is-everything/. For more information about the LifeWorks total well-being solution, visit https://www.lifeworks.com/uk/. LifeWorks is an all-in-one holistic well-being solution that delivers everyday well-being for employees. It services 49,000 businesses, provides a network of 20,000+ clinical experts and 16,000 retail merchant partnerships. LifeWorks is on a mission to help companies play a meaningful and significant role in their employee’s well-being by driving down healthcare costs, preventing absenteeism and boosting community and company culture through pro-active and preventative programmes that employees love using every day. For more information on the LifeWorks difference, visit https://www.lifeworks.com/uk/solution/employee-engagement-wellbeing-solution/.